Springhill is a development that comprises four house styles, of either four or five bedroom homes, with exceptional layouts offering capacious and versatile living accommodation. Developed by Barwood Homes, this development offers prospective buyers a quality finished home in the beautiful market town of Shipston on Stour. Barwood’s quality is evident not only in the finished homes, but attributed to the skilled professionals involved in the overall process. Every Springhill home has been sympathetically and empathetically designed to blend seamlessly with its existing surroundings. Keylite’s Conservation roof windows compliment the traditional style of these new build homes. The black central glazing bar and low profile external flashing maintain the traditional appearance of the buildings, whilst still accommodating the flow of natural light to the interior below. 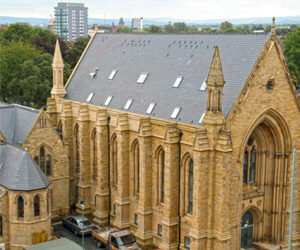 Keylite’s Conservation roof windows provide a practical and stylish feature, flexible to suit any lifestyle.